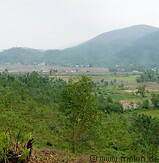 Central Vietnam consists of a thin strip of coastal plains bordered by the hills and mountains of the Annam range. Rice is cultivated in the plains and in some places the rice paddies almost border the sea. In the area there are sandy beaches.